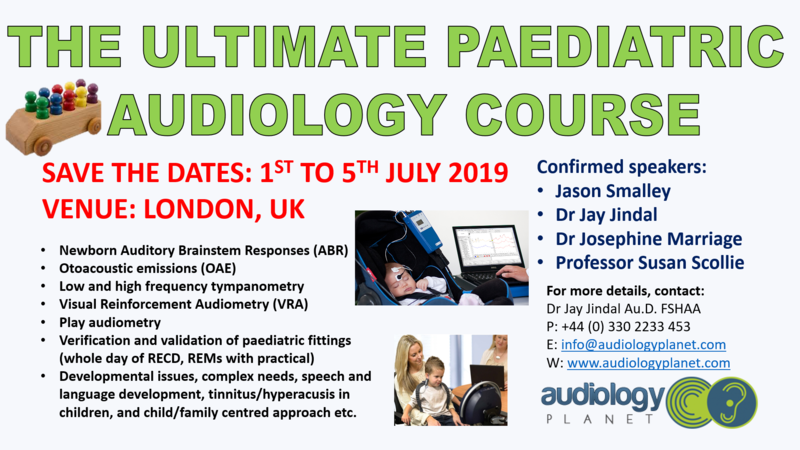 This popular and successful paediatric course will cover infant ABR training (1st and 2nd July) and paediatric hearing habilitation (3rd to 5th July) with national and international experts delivering the content. We have two new days to cover objective assessments used with cases referred from the newborn hearing screening programme (NHSP). These days are focussed on auditory brainstem response (ABR) testing and the interpretation of traces and on recording and interpreting diagnostic otoacoustic emissions (OAE). This component is followed by behavioural testing using visual reinforcement audiometry (VRA) including carrying out peer review of practical testing. This is followed by theory and practice in the process of verification and validation of amplification for babies and children with hearing loss. Our main speakers include Professor Susan Scollie, Dr Josephine Marriage, Dr Veronica Kennedy, Jason Smalley, Dr Jay Jindal. There is the option of ongoing mentorship around clinical practice needs. Individual days are bookable within the course content. For more information, contact Dr Jay Jindal at E: info@audiologyplanet.com; P: 0330 2233 453; or visit www.audiologyplanet.com/education for full range of hearing and earwax removal related courses. • Theory and practical of verification (RECD/REM) of paediatric hearing aid fittings.